When it comes to making deviled eggs, I keep my ingredients pretty classic, but I love adding little pickle juice to my the yolks for a pop of flavor! 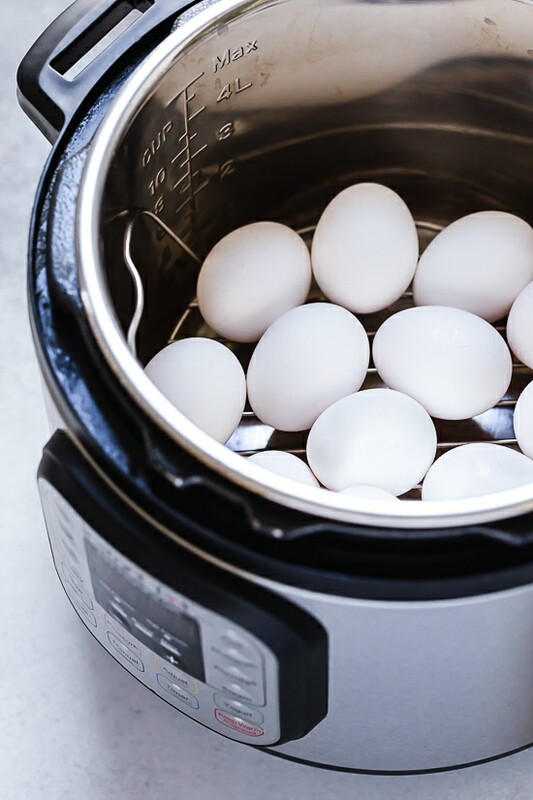 Making hard boiled eggs in the Instant Pot will give you perfect, easier to peel eggs every time. 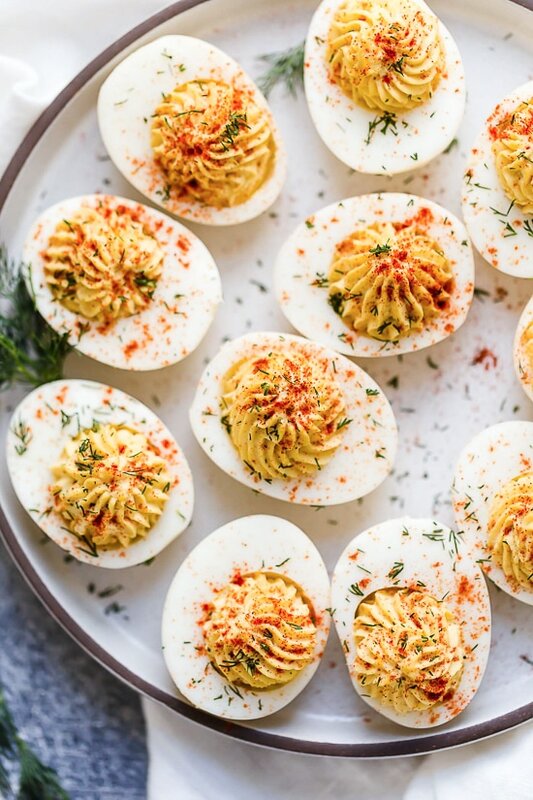 These amazing deviled eggs are a classic recipe and perfect for the holidays, potlucks, parties and other gatherings. 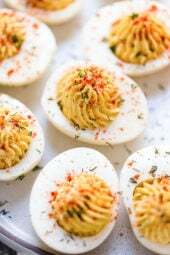 I have tons of appetizer recipes, but Deviled eggs are my favorite, and what I love most is they are inexpensive and made with ingredients I always have on hand. I also love tuna deviled eggs and guacamole deviled eggs. 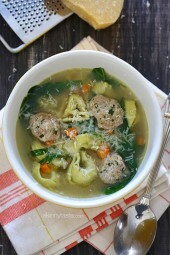 Use your Instant Pot! Eggs cooked in the Instant Pot practically pop right out of there shells! It’s a game changer! You can see my post on how to make PERFECT hard boiled eggs or soft boiled eggs in the Instant Pot. Super fresh eggs are going to be hard to peel regardless of what you do, so it’s best NOT to hard boil eggs the same day they are purchased. The best eggs for boiling are at least 10 days old. 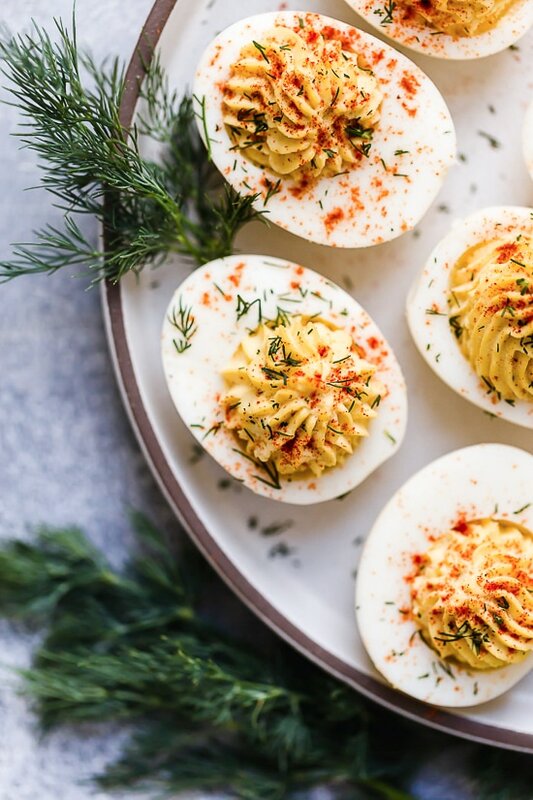 How Far Ahead Can I Make Deviled Eggs? 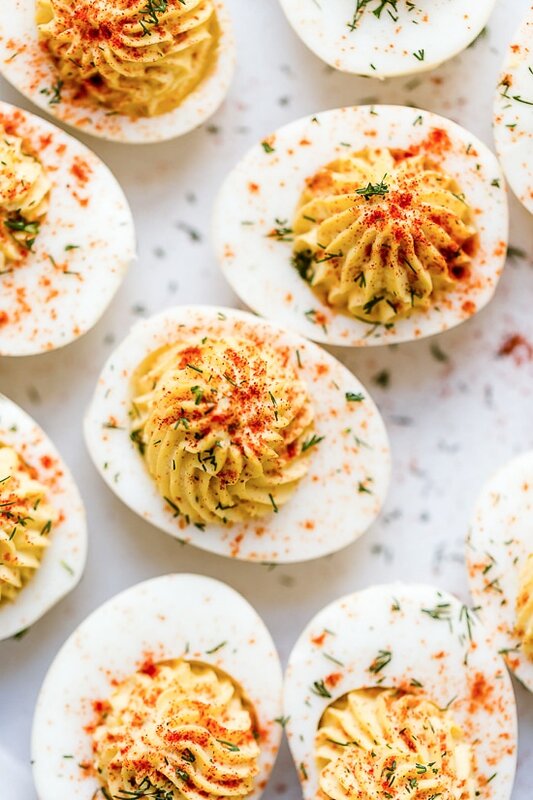 You can make deviled eggs as far as 2 days in advance, keeping the egg whites and the filling separate and refrigerated until the time comes to assemble. High pressure on manual 5 minutes. Natural release 5 minutes then use quick release, then quickly run the eggs under cold running water until cool enough to hold. Peel the eggs and slice in half lengthwise. Remove yolks and transfer to a medium-sized bowl. Add the mayo, milk, pickle juice, salt, pepper then use a fork to mash well. Spoon filling into each egg white. Sprinkle with paprika, dill and serve. These look delicious! 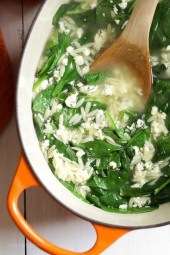 I am going to make these for our potluck this weekend. What tip did you use to pipe the filling into the eggs? 6 minutes natural release and then 6 minutes Ice bath. Then you crack and roll a little bit on its side and they peel amazingly!???? I always thought what made the eggs “deviled” was mustard. 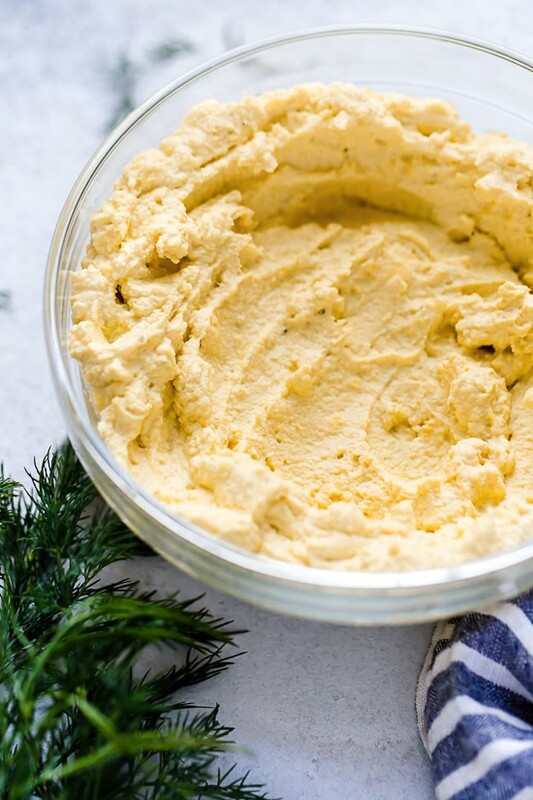 My family uses dry mustard mixxed in with the mayonaise, salt and pepper. Just an FYI…”Egg Land’s Best” eggs peel easy no matter how fresh! Probably only available in parts of California but my friend’s family owned the company…they feed those chickens different food! And who would have thought that you could pressure cook eggs? I’ve got to try it! I use pickle juice in my deviled eggs too! I have never added milk before, I will have to try that. I read somewhere that if you turn the carton of eggs on its side for 24 hours before cooking, the yolks will stay centered when you cook them! Can’t wait to try this! 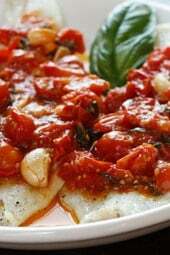 Thank you for your awesome recipes. I’m guessing that doubling the recipe (12 eggs) would still only need a cup of water and the 5-5-5 timing? I am the official Deviled Egg Maker, for holidays. I’ve been using the instant pot for eggs for 2 years now and can promise I would’ve bought one years earlier had I know how easy the eggs peel. It’s Amazing! !I always use the 5-5-5 method, it works perfect!. How do you know if the yolks are fully cooked? I did 555 but my second batch the yolks were more yellow and mushy like, rather than pastel yellow and kind of powdery. Are they not good to eat? Undercooked? I see pressure cook for 5 minutes, natural release for 5 minutes…what is the other 5 for? I read a little further and found the last 5 is ice bath…sorry!